Usually when we all fast, I think we land up eating more than normal. I always find that the food we prepare for fasting is so much tastier even though we don’t use many spices. Most of what we prepare during fasting is full of carbohydrates. However these are good carbs, high in soluble fiber and have low glycemic index, as long as your preparation is not fried. I don’t like the fried puris that are usually prepared during fasting as I find them too oily. So a good alternative to the puri is farali theplas or even farali rotli (roti). Yes, you read right farali rotli. Delicious with whatever farali sabji you make. Some of the healthy options for fasting and also to incorporate in your daily diet are amaranth (rajgira), buckwheat (kuttu), water chestnut (singhara), little millet (samo, sama), tapioca (sabudana, sago). Can have these in grain form or in flour form to make pancakes, parathas, uttapams, idlis, dokras, theplas etc. All are gluten free and full of good nutrients. Most farali flours contain amaranth (rajgira), tapioca (sabudana) and little millet (sama) flours. The proportions may vary according to how the various companies or brands make it. Some add buckwheat flour and singhara flour too. 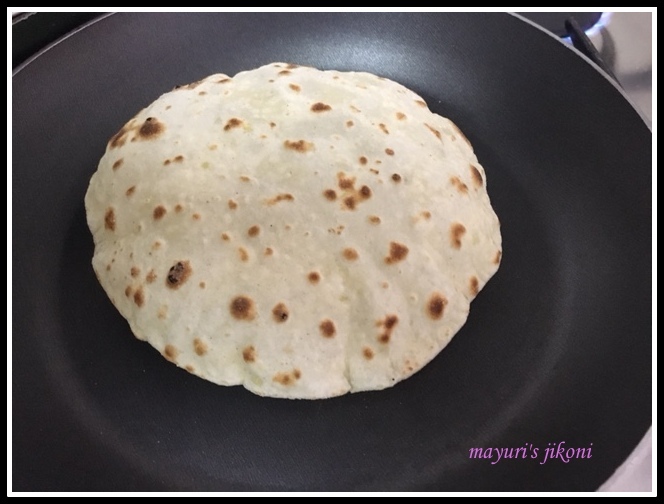 Making this farali roti is very easy. Its also an excellent gluten free option. Its difficult to bind the farali flour on its own. Add a boiled and mashed potato or green banana and the dough becomes pliable and the rotis turn out soft and not chewy. Buy the farali flour from a well reputed store. Add mashed potato and oil and mix it into the flour. Add water gradually and make a soft pliable dough. Cover the dough and let it rest at least for 30 minutes. Heat tawa or frying pan over medium low heat. Take one part of the dough. Roll it into a ball. Coat it lightly with the extra flour. Place on the rolling board or worktop and roll into a circle of 5-6 inch diameter. In between if the dough sticks, just dust it with more flour. Put the rolled roti on the tawa. Roast it till bubbles appear. Turn it over and roast for 20 -30 seconds. Can let it puff up over naked flame if you like. Repeat steps 7 to 14 with the remaining dough. You can smear a bit of ghee over the rotis before serving. I like to peel and cut the potato into small cubes. I then boil them and remove it from the water as soon as they are done. Mash it and use. Use normal tap water. The amount required will depend on how much water is absorbed by the flour. Can add a bit of salt to the flour if you like. I love your farali rotlis they have puffed up so very well. The farali rotis look so soft and nice.. now that I am in India I will try out during my fasting days.. In Brazil we couldn't get the flours we use for fasting. i am using farali atta of sri swaminarayan. they are not on net. but that flour is so easily made. that i started suspecting gluten in it or the presence of guar gum or xanthum gum. he say he has only three flours in it…..mordhan, rajgira and singhoda. its packet does not mention sago flour. nor he talked about it. what u say. iBook at the texture of these rotis and puffed up so well!! So well shaped and look so inviting.. The recipes is very useful for those on gluten-free diets.. I have to make rotis with amaranth ,tapioca and water chestnut flours, can you please tell me the proportion of flours to use ? Cannot find ready made farali flour here. We are very sensitive to wheat. Hi Pervez, try out equal amounts of amaranth and water chestnut flours and add half quantity tapioca. If you like you can also use only barley flour and add a bit of boiled and mashed potato to make gluten free rotis.